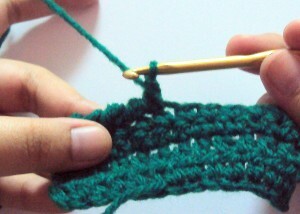 The reverse single crochet stitch, also known as the crab stitch, is made by doing single crochet stitches. With one major difference: the stitches are done in the opposite direction. So right-handed people work the reverse sc from left to right, and left-handed people from right to left. 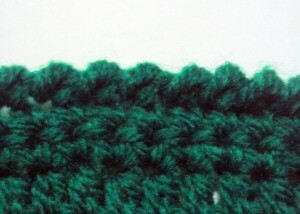 This stitch is pretty distinctive; it looks ridged and makes a nice finishing option for crochet items. I personally love using this stitch for bag handles and baby things–it makes items sturdier. And it looks like a hand-sewn edging, too. It looks great when worked as an edging using a contrasting or coordinating color. Here’s a step-by-step tutorial for the crab stitch, or reverse sc. Mousing over the images will show the photos for the left-handed tutorial. 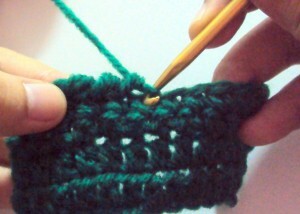 Insert hook into stitch to the right, for right-handed crocheters; and to the left for left-handed people. Yarn over. One reverse sc, or crab stitch, made. I hope that was helpful! If you need more help, just leave a comment below. This entry was posted on Tuesday, December 21st, 2010 at 12:00 AM by Claire Ortega-Reyes	and is filed under Tutorials and Help. You can follow any responses to this entry through the RSS 2.0 feed. You can leave a response, or trackback from your own site. Thanks, Claire – I like the look of this stitch a lot! Though it felt a little unnatural, I got through the first row just fine – but now I am stumped. Where do I insert the hook in this stitch? Without the standard two top loops, I’m not quite sure where to insert the hook. Thanks! Hiya Liv, that was fast! 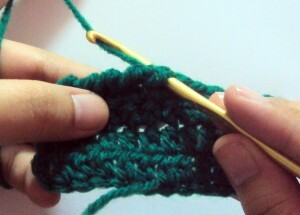 This stitch is usually done as the last row on projects. I haven’t tried doing otherwise… Maybe you could experiment on ways to build on the crab stitch. 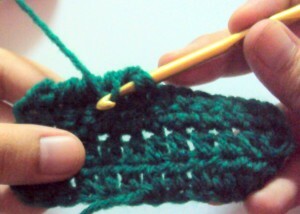 Try working stitches into different loops of the stitch. Maybe you’ll come up with a brand new technique! I think that a row of reverse sc looks sort of like an unfinished Tunisian row… Maybe you can try that. Gotcha! Fast reply, too! Thanks, Claire – makes much more sense as a last row! I played around briefly but didn’t really try too hard – considering it is 1:00 in the morning. 🙂 I have tried Tunisian using the tutorial on this site. I like the look of it but I am never able to make it work – it always ends up being completely diagonal. Since I am starting to get into knitting (and Tunisian basically gives the look of knitting to a crochet piece) I haven’t tried very hard with that, either. I am making myself sound like a really fairweather crocheter! But if it’s something I am really trying to master I will look up videos on youtube and keep putzing til I figure it out! Liv, the crab stitch is a great way to finish necklines on tops, since it keeps them from stretching. 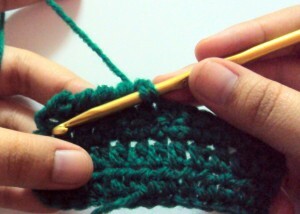 I always feel totally handicapped when I do it, though, since it is so opposite from all the other crochet stitches! Thanks for the reverse sc – it makes a beautiful edging. Perhaps a little clarification should be made in your instructions – finish your last row on the right side and don’t turn your work…maybe I had a bit too much egg nog but it took me awhile to figure it out!! it makes a very unique edging great for potholders or as mentioned a baby blanket. Claire, thank you so much for ‘flipping’ the pictures for us lefties. That is just one of the things that I love about this website. This stitch has always stumped me. I’ve always heard that it’s great as the last row of a top, but I could never figure it out. Thanks again! I am going to add this to the next item I make. Thanks for the tutorial. I’m not a lefty, but I thought it was nice that you included a lefty tutorial. Dawn, this is the tutorial for the reverse single crochet. Let me know which part of the stitch you need help with and I can try and help you better. Thanks again for the lefty help….I couldn’t get how to transpose this stitch with the usual youtube videos. Wow thanks for that… so simple when you know how. Greetings from Sunny SA…although it is currently raining. Thank you, Rachel! So helpful and clear! Thank you so much for your clear instructions. I have tried different tutorials and explanations but still struggled. With your tutorial, however, it became clear and I’m now smiling while working in the opposite direction…. Hi Everyone! I am working on a simple ripple afghan for my older sister. I have just about finished it, but I was wondering how I would finish it off. I think this crab stitch would be a great way to finish it at the top and at the bottom. I am going to put short tassels on the sides. Thanks for the idea! I’m starting an afghan pattern for a crab stitch; however, this calls for doing the crab stitch in the ‘front loop only’ b/c it wants you to do a ‘double crochet’ on the return in the back loops of the crab stitch on the previous row. I apologize if this is confusing; but I am as confused as my comment. If you only work in the front loops, then the back loops will still be un-worked. You can work into the back loops as you stated with the double crochets. Hi there. Quick question to make sure I understand! If I’m doing the crab stitch to.finish a hat, I’ll want the right side facing me, correct? Thanks in advance! I love crab stitch, especially to finish off a baby blanket! But I always struggle with joining the two ends together once I’ve gone all the way around the blanket. How do you finish yours off and combine the ends without it looking bulky? Thank you so much! I searched all day for a clear tutorial and thanks to you I did it! I’m left handed, but still was able to do it! Can you show how to work this with 2 colours please. Can it be done with DC or hdc as well. TY for the easy tutorial !! I have never heard of the stitch but I love it. I’ve used this stitch for almost 50 years. It was in a Coats & Clark baby afghan pattern. At first, the first couple of stitches were cumbersome, but once I got over going backwards over the first stitch, I got into a rhythm and LOVE THIS STITCH! But I am confused, someone said they were looking for. if for the crab stitch and they were told it was double crochets going backwards? Will have to try it, just to see if it is a new possibility. This stitch gives a unique, pretty, finished edging. I believe it also adds to the wearability or usability of the item.